Our team will fix your business or home PCs as quickly as possible with advanced diagnostic methods. If downtime occurs, we’ll provide a replacement so you’re not inconvenienced. We offer a comprehensive computer repair service for businesses and residential PCs to get you back up and running as quickly as possible. We use advanced methods to diagnose your computer repairs, whether focusing on one machine or several devices. At Woodstock IT our fully trained team of professionals carry out fixes on a range of models. When possible we will complete our fixes with an on site visit for minimal disruption to your company and home life, or through running bench tests at our drop in clinic in Horsham. For businesses it’s especially important to fix the issue before inconveniences turn into system failures, increasing the cost of services and disruption to your company. Get in touch on 01403 290 321 or 01293 912 321 if your computer is running slowing, you’re suffering intermittent faults or can see hardware damage. We can help with all leading manufacturers including HP, Dell, Lenovo, Compaq, Sony and Apple and work on both the popular Microsoft Windows and Apple operating systems. When we carry out repairs on a computer or server we will assess the equipment based on its age, condition and the tasks you require it to complete regularly. Provided a computer is well maintained you may find that replacement is not necessary and a simple inexpensive repair will restore the equipment to a perfectly serviceable state. However, in some circumstances when a machine is no longer viable for the task you are asking of it, a replacement may be advised. This is especially true when the requirements from the updates for operating systems and software are greater than the previous versions. As software advances and your machine ages, updates leave it vulnerable to having it’s hard drive space, RAM or screen definition pushed to the limit. If you have concerns, talk to us first and don’t risk complete computer or service failure. Should you require a temporary PC or PCs to carry out your tasks while yours is being fixed, please let us know and we will endeavour to supply equivalent models for you to stay connected and productive during the short interim. We will endevour to repair your computer as quickly as possible, whilst delivering an effective and cost efficient service. All of our work is charged at a standard hourly rate. Once we quote time for our work, you’re under no obligation to accept. 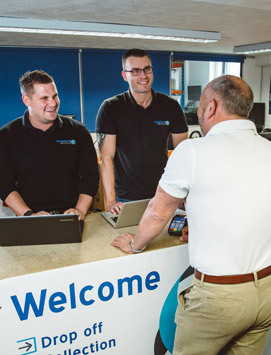 Please get in touch for more information on our computer repair services throughout Sussex and Surrey, including Horsham, Crawley, Guildford, Worthing, Henfield, Pulborough, Dorking and Gatwick by calling our hotline on 01403 290 321 or 01293 912 321.